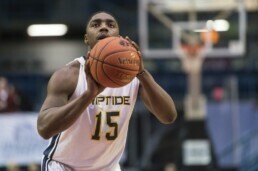 National Basketball League client Frank Bartley is making his mark in the National Basketball League of Canada. Frank currently ranks sixth in NBLC scoring at 19.4 points per game and averages 5.5 boards and three assists per game. In conjunction with his rising stardom, Frank was awarded NBLC player of the week following a week’s performance that saw him average 19.3 points and 11.1 rebounds per game.